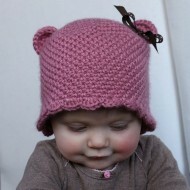 Time for another variation on my free Versatile Earflap Hat Pattern! 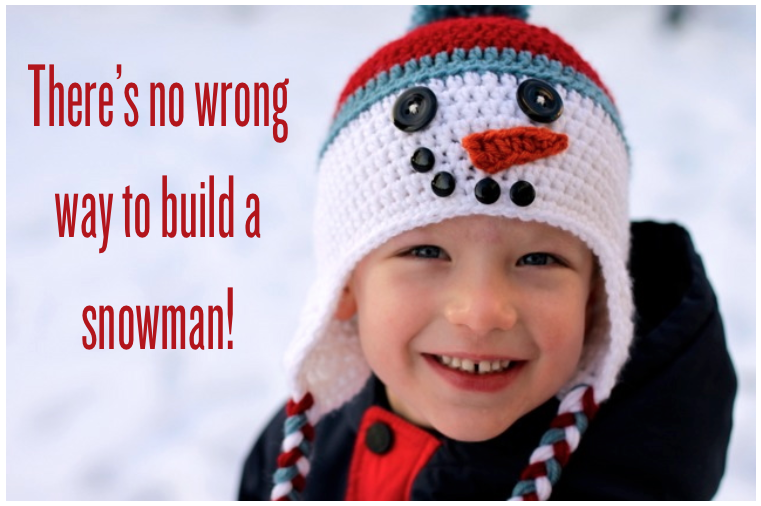 My youngest son just loves to wear these earflap hats – so much that anytime I start a project, he is always there at my side saying, “Is this for me?” Here’s how to make his current favorite, the snowman. 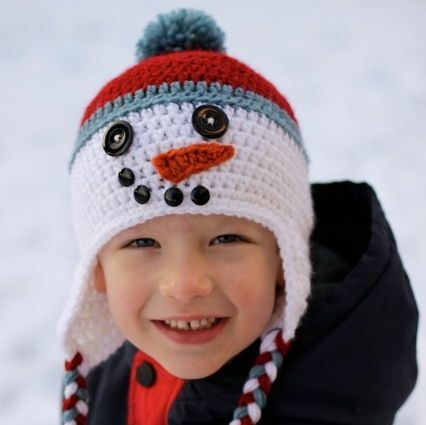 Start by downloading the instructions for the Versatile Earflap Hat Pattern (if you haven’t already), and follow the instructions below to customize the hat into a snowman. 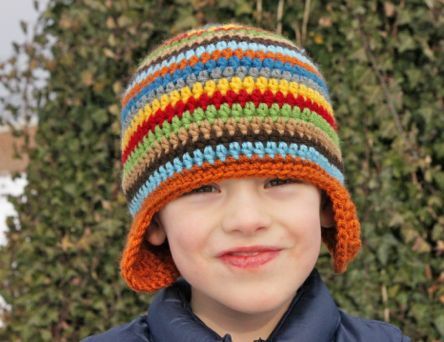 I used Lion Brand Vanna’s Choice Yarn for this hat in Cranberry (color A), Dusty Blue (color B), White (color C) and Terracotta (for the carrot nose). Finish all sizes by adding a carrot nose and any combination of buttons or felt shapes to make the eyes and mouth. 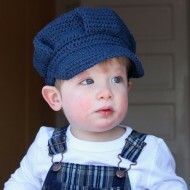 For the child size hat pictured I used 1″ buttons for the eyes and 1/2″ buttons for the mouth. I also topped my snowman hat off with a pom pom made in color B and braids on the earflaps in colors A, B and C.
With orange yarn and a H (5.0mm) hook, ch 6. Sl st in the 2nd ch from hook, sc in next 2 ch, hdc in next ch, 2 hdc in last ch. Fasten off leaving a long tail for sewing the nose to the hat. With orange yarn and a H (5.0mm) hook, ch 8. Sl st in the 2nd ch from hook, sc in next 2 ch, hdc in next 2 ch, dc in next ch, 2 dc in last ch. Fasten off leaving a long tail for sewing the nose to the hat. It’s beginning to look like Christmas around here and, of course, that means time for some fun new crocheted hats. Using my free Versatile Earflap Hat Pattern, I made Santa hats for my boys to celebrate the season. This hat is very much like my Lucky Leprechaun Hat, with the addition of some fuzzy trim. To make one of your own, simply download the Versatile Earflap Hat Pattern here and follow the instructions for changing colors below. Finish all sizes by completing the 2nd edging in a bulky, fluffy white yarn. I used Bernat Pipsqueak in Whitey White for my hats. Finally, make a belt buckle for your hat. With yellow or gold yarn and an I (5.5mm) hook, ch 19. (Sc, ch 2, sc) in 2nd ch from hook, sc in next 4 ch, (sc, ch 2, sc) in next ch, sc in next 3 ch, (sc, ch 2, sc) in next ch, sc in next 4 ch, (sc, ch 2, sc) in next ch, sc in last 3 ch. Sew the beginning and end of the buckle together and sew it to the hat. With yellow or gold yarn and an I (5.5mm) hook, ch 23. (Sc, ch 2, sc) in 2nd ch from hook, sc in next 5 ch, (sc, ch 2, sc) in next ch, sc in next 4 ch, (sc, ch 2, sc) in next ch, sc in next 5 ch, (sc, ch 2, sc) in next ch, sc in last 4 ch. Sew the beginning and end of the buckle together and sew it to the hat. Wishing you cheerful holidays and happy new yarn! We are! This summer has been fun but it is quickly drawing to a close as school will be starting here in Pennsylvania later this month. 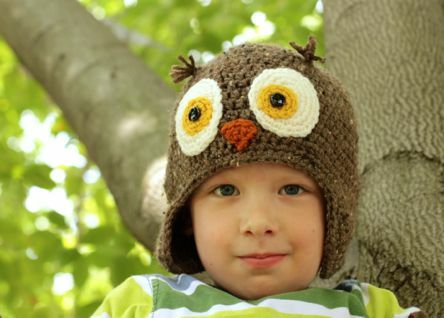 My boys are super excited so we made a wise owl hat to get ready. Fun holiday-inspired hats made with my free Versatile Earflap Hat Pattern are some of my favorite crochet projects. With a bit of yarn and a little time, you can make something that will spread holiday cheer and get tons of compliments. 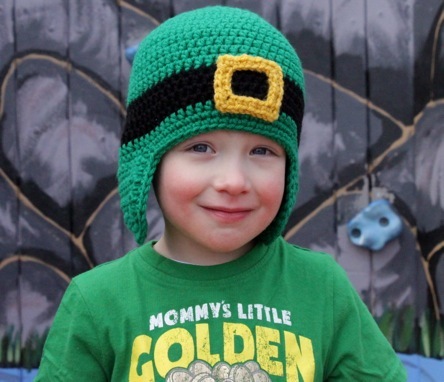 This week I’m sharing this cute Lucky Leprechaun Hat. To make one of your own, simply download the Versatile Earflap Hat Pattern here and follow the instructions for changing colors below. With yellow or gold, ch 19. (Sc, ch 2, sc) in 2nd ch from hook, sc in next 4 ch, (sc, ch 2, sc) in next ch, sc in next 3 ch, (sc, ch 2, sc) in next ch, sc in next 4 ch, (sc, ch 2, sc) in next ch, sc in last 3 ch. Sew the beginning and end of the buckle together and sew it to the hat. With yellow or gold, ch 23. (Sc, ch 2, sc) in 2nd ch from hook, sc in next 5 ch, (sc, ch 2, sc) in next ch, sc in next 4 ch, (sc, ch 2, sc) in next ch, sc in next 5 ch, (sc, ch 2, sc) in next ch, sc in last 4 ch. Sew the beginning and end of the buckle together and sew it to the hat. If you like this hat and want to try more St. Patrick’s day variations, check out my Rainbow Hat, Shamrock Hat and Irish Colorblock Hat. Thanks for stopping by and have fun crocheting! If you’re like me, you just can’t part with your yarn. 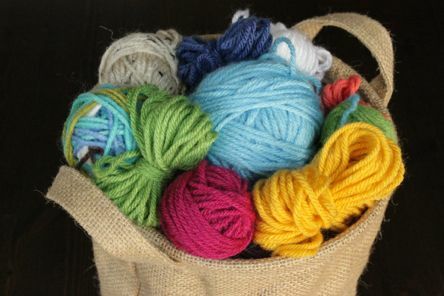 You finish a project, and even though you only have a small amount of yarn left, you wrap it up into a little ball and save it. But what will you do with it? At this time of the year when everyone is focused on cleaning out and organizing, I figured I would put my basket of leftover yarn and my free Versatile Earflap Hat Pattern to work to make something extra cute and fun to wear (plus with all the colors it will go with so many things). I love that I could make this hat from what otherwise could have been thrown in the garbage. The only bad thing about it – lots of ends to weave in! So if you have a basket of yarn leftovers that you are looking to use, grab my Versatile Earflap Hat Pattern here and get to work. As I was making the hat pictured above, I took rough measurements of the yardage required for each round and I made a handy dandy chart for you. You can download the chart I made by clicking here. Just measure the small lengths of yarn you have on hand to see if they are long enough for the hat you want to make. 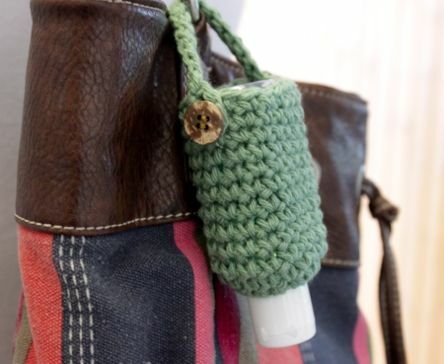 Be sure when you are measuring that you don’t stretch the yarn or else your length of yarn will actually be too short. 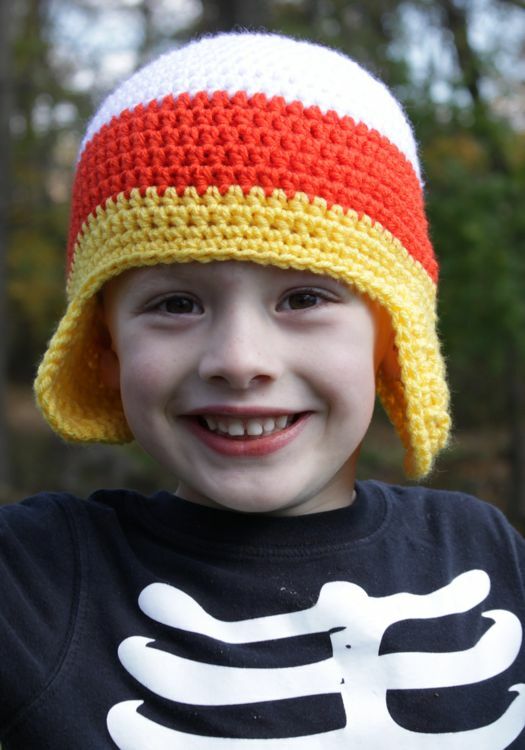 For the earflaps and edgings, I used about 26 yards of orange for the child size hat. 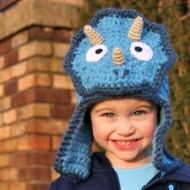 You may need a little more for the adult size hat, but that will be more than enough for the smaller sizes. Additionally if you don’t like the look of every round being a different color, you can use the chart to see if you have enough yardage to add just a stripe or two to a solid color hat. I like this idea so much that I set up a station so that if I have leftover yarn from a project I can label it for a future project. Oh, the possibilities! I can’t wait to fill it up and get creating. 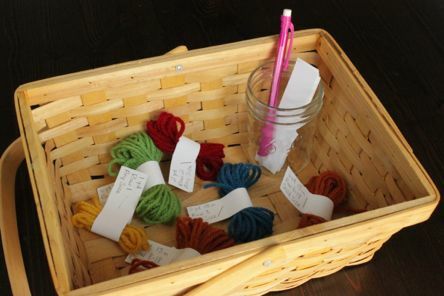 I hope you have enjoyed this Free Pattern Friday and that you can put your scrap basket to good use too! Thanks for stopping by!! Need a quick and easy handmade gift idea? 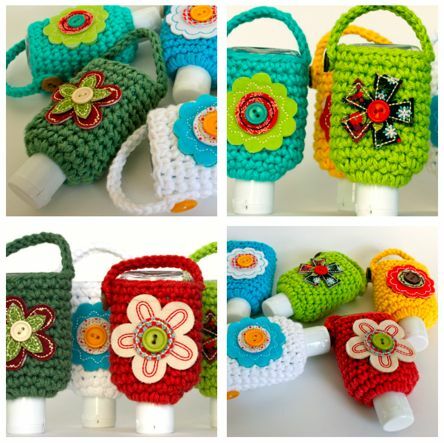 This free crochet pattern will show you how to make these cute little cozies for the small travel bottles of hand sanitizer (2 fl. oz. size). …or you can embellish them any way you want! 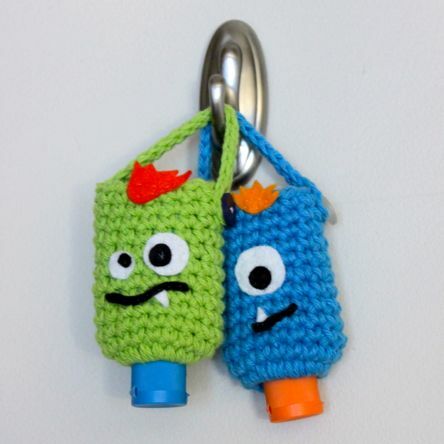 These monsters reside on my boys’ school bags to help kill germs and keep them healthy. All the embellishments were cut from felt and sewn on. 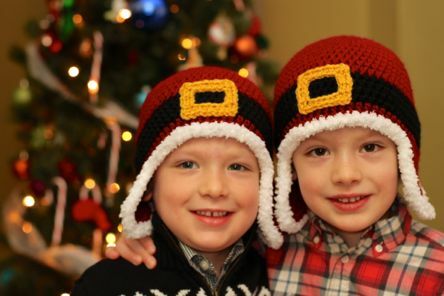 I’m not going to lie – that took at long time, a lot longer than crocheting the cozy – but I think they turned out adorable and my boys love them. 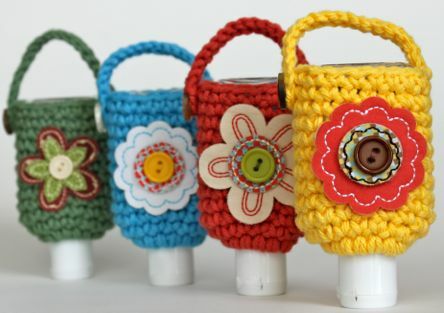 The cozies in these pictures are going to make great little gifts this holiday season, and they were super easy. The embellishments are just fabric stickers intended for scrapbooking. I actually got mine as a daily deal at PickYourPlum so I can’t give you a link to these exact stickers, but I think any fabric embellishments that have a very sticky back will work well. So go ahead and download the pattern by clicking the download button above and with a little bit of time and a little bit of yarn, you can make this for someone on your list (or yourself) too. I hope you will love it! 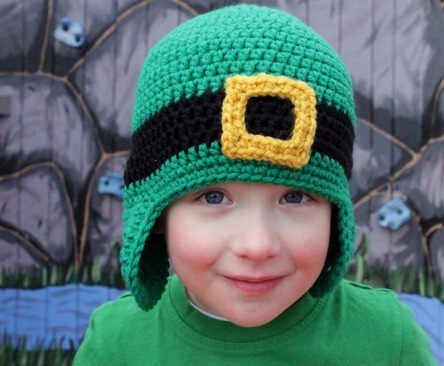 I just loved the Irish Flag Colorblock Hats I made for my boys for St. Patrick’s Day so I decided to make one for Halloween too – the Candy Corn Colorblock Hat. I used Hobby Lobby’s I Love This Yarn in white, orange and yellow. 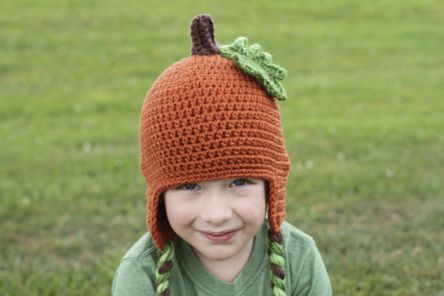 It will be the perfect hat to wear to our town’s Halloween Parade this week! Wanna make one? You can download the Versatile Earflap Hat Pattern here, and then take note of where to change colors for the size you are making below. 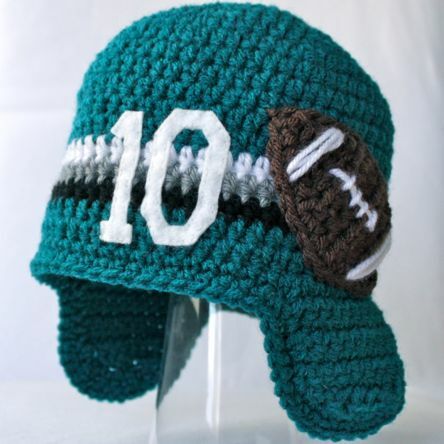 Earlier this year I made Crochet Football Applique Hats for my two boys for Superbowl Sunday. The hats looked so cute and it was a fun way to show team spirit. Of course, when my nephew saw them, he wanted one of his own. His mom had the great idea of adding his favorite player’s number to the hat. Now that football season is here again, I thought I would share the idea with you. 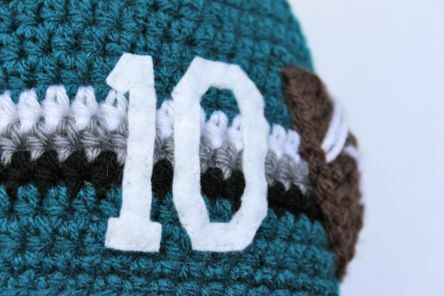 Find all the information you need to make the Football Applique Hat here. Then simply cut the number you would like to use out of felt and sew it to the hat with a running stitch. This idea isn’t just for professional teams either. 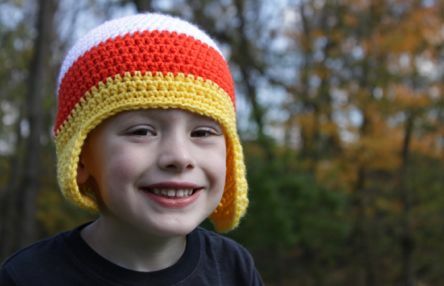 It would be great to use for your own football players in their team colors too – a special hat made just for them! Nothing puts me in the mood to crochet more than cooler temperatures. Fall is my favorite season and I’m so excited it is finally here! One of the best parts of fall is that it is apple season. 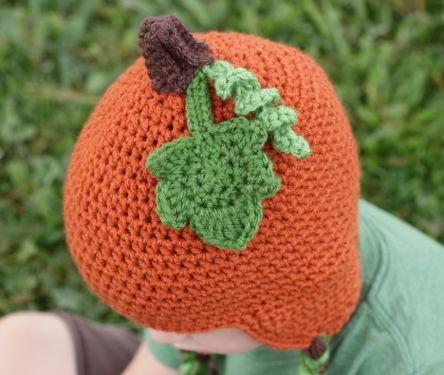 To celebrate fall (and a friend’s new baby) I had to make an apple hat from my Versatile Earflap Hat Pattern, of course. 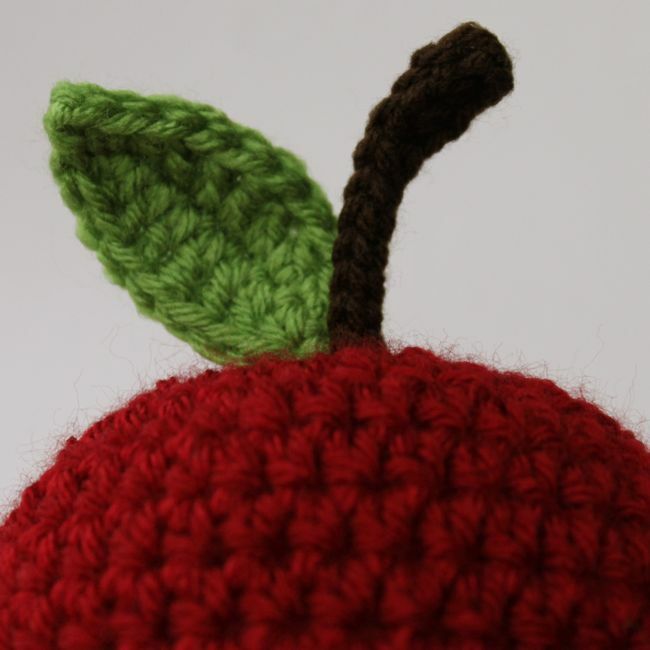 To make an apple hat of your own, simply follow the instructions in my pattern available here, making the entire hat in red. Then follow the instructions below to make a stem and a leaf. Sew the stem and leaf to the top of the hat and add braids to the earflaps. 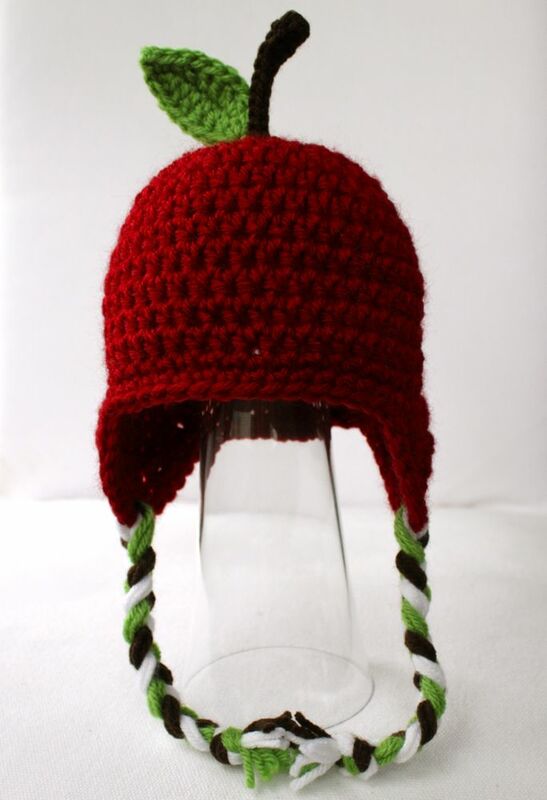 Now you have a sweet apple hat too! Ch 12. Dc in 3rd ch from hook, hdc in next ch, sc in next 2 ch, sl st in next 6 ch. Fasten off leaving a long tail to sew the stem to the hat. Ch 10. Sc in 2nd ch from hook, hdc in next ch, dc in next ch, htr (see below) in next 3 ch, dc in next ch, hdc in next ch, sc in last ch. Ch 2, sl st in 2nd ch from hook. Working along the other side of the chain, sc in next ch, hdc in next ch, dc in next ch, htr in next 3 ch, dc in next ch, hdc in next ch, sc in last ch. Fasten off leaving a long tail to sew the leaf to the hat. Htr (half treble crochet): Yarn over 2 times, insert hook in stitch and draw up a loop (4 loops on hook), yarn over and draw through 2 loops (3 loops on hook), yarn over and draw through 3 loops (1 loop left on hook).